Density and phase ? g/cm3, solid. Melting point 360°C (633.15 K) deco. R/S statement R: R36, R37, R38. 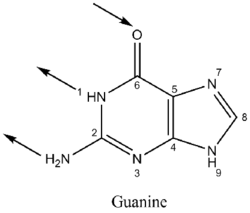 Guanine, a two-ring molecular structure, is one of the five defining components or nucleobases found in the nucleic acids DNA and RNA; the others being adenine, cytosine, thymine, and uracil. Guanine and adenine are derived from the two-ring parent molecule purine, and cytosine, thymine, and uracil are derived from the one-ring parent molecule pyrimidine. 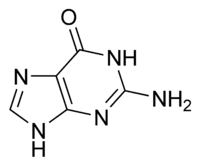 Guanine (C5H5N5O), comprises a six-carbon pyrimidine ring fused with a five-carbon imidazole ring to form a system stabilized by conjugated double bonds (the positions of the double bonds shift around the ring). Being unsaturated, the bicyclic molecule is planar. The guanine nucleoside (guanine bonded with a five-carbon sugar) is called guanosine and lacks only a phosphate to form a nucleotide. In DNA, guanine and adenine form hydrogen bonds with their complementary pyrimidine derivatives, cytosine and thymine. In RNA, the complement of adenine is uracil instead of thymine. Thus, guanine, along with adenine and cytosine, is present in both DNA and RNA, whereas thymine is usually seen only in DNA and uracil only in RNA. The ubiquitousness of guanine, which plays a central role in the the DNA of all living organisms and even in RNA viruses is evidence of the connectedness and unity of all life. Guanine binds to cytosine through three hydrogen bonds. In cytosine, the amino group acts as the hydrogen donor and the C-2 carbonyl and the N-3 amine as the hydrogen-bond acceptors. Guanine has a group at C-6 that acts as the hydrogen acceptor, while the group at N-1 and the amino group at C-2 acts as the hydrogen donors. Guanine has two tautomeric forms: the keto form (characterized by an attached OH group) and the enol form (characterized by an attached CH2 group). Guanine can be hydrolyzed with strong acid at 180°C to glycine, ammonia, carbon dioxide, and carbon monoxide. Guanine oxidizes more readily than adenine, the other purine-derivative base in DNA and RNA. Its high melting point of 350°C reflects the strong intermolecular hydrogen bonding between the oxo and amino groups in the molecules in the crystal. Because of this intermolecular bonding, guanine is relatively insoluble in water, although it is soluble in dilute acids and bases. The first isolation of guanine was reported in 1844 from sea bird excreta, which is known as guano and was used as a source of fertilizer. 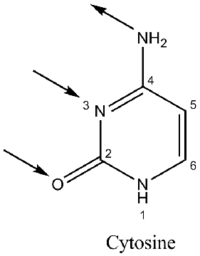 About fifty years later, Fischer determined guanine's structure and showed that uric acid can be converted to guanine. The first complete synthesis of guanine was done by Traube and remains among the best large-scale preparations. Trace amounts of guanine form by the polymerization of ammonium cyanide (NH4CN). Two experiments conducted by Levy et al., showed that heating ten mole NH4CN at 80°C for 24 hours gave a yield of 0.0007 percent while using 0.1 mole NH4CN frozen at -20°C for 25 years gave a 0.0035 percent yield (Levy et al. 1999). These results indicate guanine could arise in frozen regions of the primitive earth. In 1984, Yuasa reported a 0.00017 percent yield of guanine after the electrical discharge of NH3, CH4, C2H6, and 50 mL of water, followed by a subsequent acid hydrolysis (Miyakawa et al. 2000). However, it is unknown if the presence of guanine was not simply a contaminant of the reaction. In 1656 in Paris, François Jaquin (a rosary maker) extracted from scales of some fishes the so-called "pearl essence"—crystalline guanine forming G-quadruplexes. Guanine crystals are rhombic platelets composed of multiple, transparent layers but they have a high index of refraction that partially reflects and transmits light from layer to layer, thus producing a pearly luster. In the cosmetics industry, crystalline guanine is used as an additive to various products (e.g., shampoos), where it provides the pearly iridescent effect. It is also used in metallic paints and simulated pearls and plastics. Crystalline guanine provides shimmering luster to eye shadow and nail polish. It can be applied by spray, painting, or dipping, but it may irritate eyes. Alternatives include mica, synthetic pearl, and aluminium and bronze particles. Horton, H. R., L. A. Moran, R. S. Ochs, J. D. Rawn, and K. G. Scrimgeour. Principles of Biochemistry. New Jersey: Prentice Hall, 2000. Levy, M., S. L. Miller, and John Oró. “Production of guanine from NH4CN polymerizations.” Journal of Molecular Evolution. 49(2):165-168, 1999. Lister, J. H. “Part II, Purines.” In D. J. Brown, ed., The Chemistry of Heterocyclic Compounds. New York: Wiley-Interscience, 1971. Miyakawa, S., K. Murasawa, K. Kobayashi, and A. B. Sawaoka. “Abiotic synthesis of guanine with high-temperature plasma.” Orig Life Evol Biosph. 30(6): 557-66, 2000. This page was last modified on 29 August 2008, at 14:09.